Does the GEICO Gecko Have a Grip Like this Guy? My cats play rough and any critter which meets their paws probably won't come out alive. That's where I come in. I try to save the poor souls and pictured is the thanks I got! Friday morning was the usual routine. Once the cats are fed, I open the door to the patio where the cats watch the world and dream of being feral kitties romping in the grass. I knew something was up when I heard excessive meowing and Sunny was intensely occupied in the living room. Looking, I saw a dark brown lizard in his grips, or so I thought. I pushed Sunny away but the lizard moved with him. Picking up the cat, I slightly shook him side to side, thinking perhaps a claw had pierced the little victim. Nope. Another look and this little Florida lizard had his jaws gripping the cat's paw! It eventually let go and made a poor attempt at hiding. Okay, it's in unfamiliar territory, I get it. 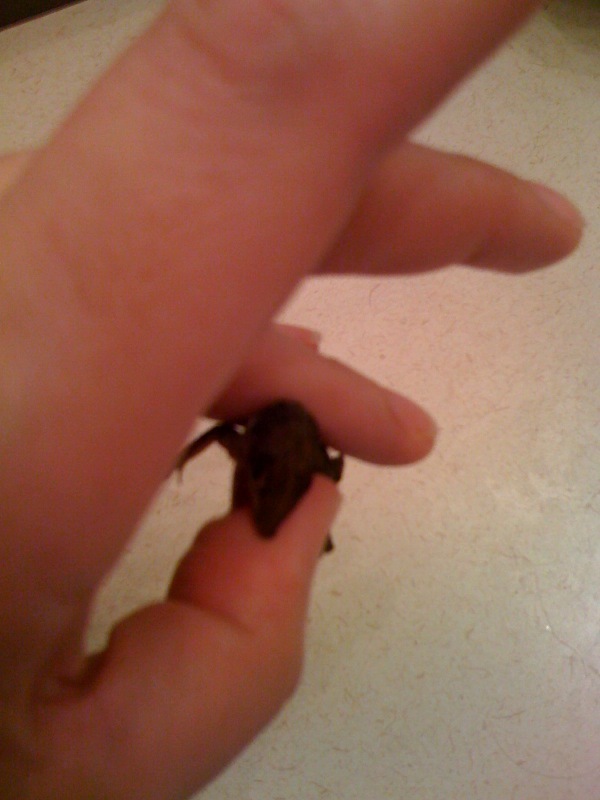 I grabbed the bugger and he swung around and latched onto my thumb! It didn't hurt but startled me. This was the first time a lizard fought back. It felt like hundreds of Velcro teeth latched onto my thumb. The situation was so funny, had to capture this Kodak moment and although this iPhone photo isn't the best, you get the idea.